Thanks to our friend and ally D. Trull, we have a fascinating historic video to share about plus-size modelling in the 1980s. Yes, a video just over 20 years old (likely from 1989, given that Barbara Bush is noted as being the "new First Lady") deserves to be considered historic. Consider the fact that this clip dates from almost a decade earlier than the debut of Mode magazine, and even predates the breakthrough of Emme. In brief, the clip shows that while the plus-size fashion industry has made advances in some areas, in other respects it has remained static, or even regressed. Note the video's opening. It claims that full-figured women now benefit from having several plus-size "role models" (by which it apparently means publicly recognized actresses), then goes on to cite Bette Midler and Roseanne as examples. And while such dismal representatives might make one shudder, consider whether today's television landscape offers anything better. There are certainly no goddesslike Kelsey Olsons or Katherine Rolls on television, nor have there been any further parts for Christina Schimdt. What do we have? Camryn Manheim? The Mike and Molly actress? These individuals embody the same frumpy stereotypes that Roseanne did two decades ago. On television, at least, there has been little progress (and possibly even regression, because a Shannen Doherty was far curvier in 1989 than her anorexic equivalents on the current 90210 show). What has improved, though, without question, is the fashion. 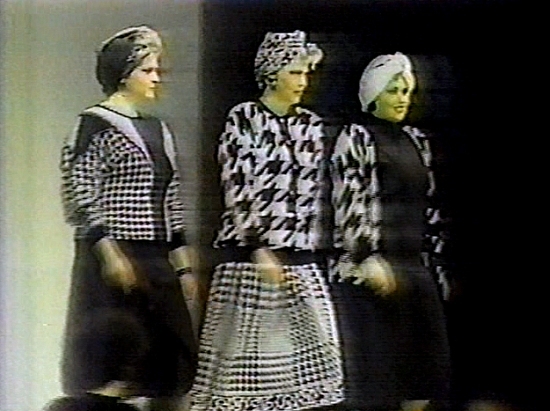 The video's opening images of a plus-size fashion show (yes, they existed in 1989, and apparently enjoyed production values at least equal to those of FFFWeek) show the models in unattractive career-wear styles that look terminally formless and dull. On the other hand, what strikes one most forcibly in this video is the look of the models. True, their hairstyling and makeup is that of "career" professionals rather than young vixens, but even through the shapeless outfits, one sees that they are solid size 16s and 18s. This model, for example, is very attractive and visibly full-featured, with attractive weight in her face. The model on the right, in this image, appears even prettier--again, with sensually full facial features and a touch of volume in her hair. Imagine her with a more vixenish hairstyle and a body-conscious outfit, and this size-16/18 goddess would be a knockout. The video footage (grainy as it is) gives a better impression of the models than these stills do, but nevertheless, the blonde goddess on the left in this screencap is stunning, with a bit of a Shannon Marie look in her round, babylike facial features. All that she would need to do is to let down her golden tresses and don a completely different outfit, and she would be a stellar example of timeless beauty. Consider the models on the right-hand page from this unidentified catalogue. The brunette exhibits visibly full hips and thighs, and although the blonde model wears a cover up, her luscious size is evident, even in the sensual weight in her face. These days, opulent Nordic models like Kelsey Olson or Katherine Roll are rare, shining exceptions. But in the 1980s, amazingly, they were the rule. No one would mistake any of these girls for straight-size waifs, as one would mistake many so-called "plus-size models" today. The following model is a tad less vixenish than the other girls, yet still very attractive. She exhibits a visible curve under her chin. She is one of the few girls in the video whose figures are clearly displayed. The outfit is horrible (as is all of the clothing in the clip), but it showcases a visible, seductive swell at her midsection. One sees the soft, fleshy, untoned fullness of her physique. Although she is not quite a top-flight beauty like some of the other girls in the video, she is still very appealing. She even exhibits sensual curves along her back. and from what one can see of the layout, the model suffers from the same affliction of shapeless wardrobe that plagued the runway models. At least the publication was creative enough to feature her being worshipped by a GQ-type male model. As an aside, the clip also includes video footage from the Spiegel catalogue. For those of you who are unfamiliar with this brand, it notoriously shot plus-size fashion on straight-size models, to the great dismay of its customers. We include the following Spiegel screencap only because it shows the lone genuinely interesting fashion item in the video. This is an iconic '80s ensemble--the delicate white gloves, the head scarf, and the distinctive hat. (Think of Christie Brinkley in the video for "Uptown Girl"). Outfits such as this appeared in countless variations in the pre-Anna-Wintour Vogue. A classy and attractive look, it is distinctive of the decade, yet very feminine. There is a good a reason why we have devoted some time to this piece. Let us imagine that the year is 1989, when this video was produced, and two people are contemplating what to do with the novel phenomenon of "plus-size modelling." One individual's approach is size-positive. The other individual's approach is negative. Guess which of the two wins the day? PRO-PLUS APPROACH: The models are gorgeous, with attractively natural, curvaceous, size-18 figures and soft, round, beautiful facial features. Let's keep that! However, let's develop more stylish and body-conscious clothing for them, and let's give them more youthful and vixenish hairstyles. 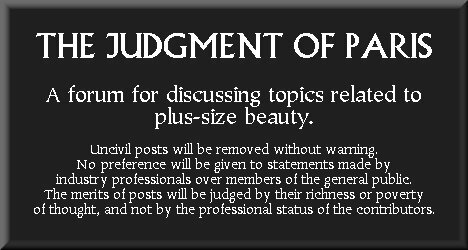 The public will respond to their voluptuous beauty, and we can build a plus-size fashion industry around them in which full-figured women will see themselves reflected in models with similar, bountiful physiques to their own, but with photogenic qualities. ANTI-PLUS APPROACH: I can't stand the sight of genuinely full-figured women, yet such women are starting to make inroads into fashion, albeit in a separate genre. I must undermine this. I am going to start shrinking the models, excluding bigger girls and selecting models who are ever skinnier, ever closer to the size of straight-size girls. Yet these faux-plus girls will occupy the nominal "plus-size" category, so truly full-figured women will be pushed out of fashion altogether. Although the public will dislike having slim girls falsely passed off as plus size, the curve-hating mainstream fashion industry will embrace the faux-plus amazons--and that's all I care about. Tragically, the latter is the approach that won out. What the industry should have done was to keep using models with visibly full-figured beauty, merely styling them in younger, more exciting ways. Models such as Kelsey or Katherine Roll, or the Brazilian goddesses like Mayara Russi, offer a glimpse of what the whole industry could have looked like today, if it had followed this size-positive path. Instead--dismayingly--while women such as the ones seen in this video could have been plus-size models in the late 1980s, today, over 20 years later, such women would be denied any modelling opportunities. 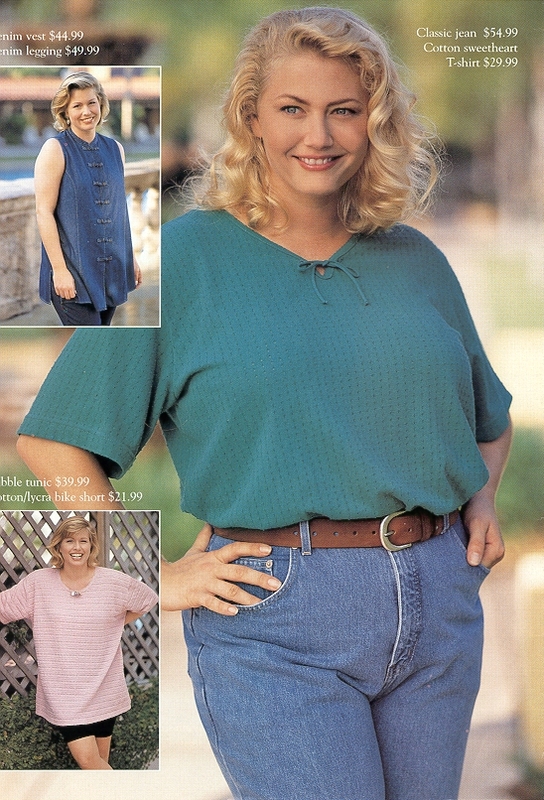 At least in 1989, authentically full-figured models appeared in certain runway shows or print catalogues. Today, they have been pushed out altogether, in favour of faux-plus models. Do you see what we mean about regression? It was actually likelier to see a genuinely plus-size body in the media 20 years ago than it is today. "I always thought a large-size woman had the capacity to be as couture as a size-8 woman." Consider the significance of that statement. In 1989, a plus-size model and a size-8 model were viewed as being on the opposite ends of the size spectrum. Size 8 stood for the proportions of a small model, in contrast to a "large-size" model. It would have been unthinkable for a size 8 to be equated with plus size. Yet this is what has happened today. The straight-size models of yesterday have been turned into the plus-size models of today, while actual plus-size models have been all but banished from fashion. In effect, the people who have diminished the plus-size industry to the ridiculous condition in which it stands today have answered Ms. Swift's statement by saying, "No, a large-size women cannot be as couture as a size-8 woman. Therefore we will diminish plus-size models into size 8s." Instead of plus-size modelling changing the thin-centric fashion establishment, the thin-centric fashion establishment changed plus-size modelling. We hope that it reminds the public that there was a time when plus-size models were genuinely full-figured. We also hope that it prompts the full-figured fashion industry of today to showcase the larger bodies that it once embraced, but has excluded for far too long. Last edited by HSG : 20th January 2011 at 14:05. This was a fashion show that I produced at Parsons school of design. All the models in the show were mine. I produced the whole show models and all. No one has perform anything such as this since. Fashion fans will immediately recognize the name "Parsons" as the design school that features prominently in the Project Runway TV series. Parsons is the physical location where all of the contestants sew their garments and where the runway presentations occur. Project Runway co-star Tim Gunn was formerly the chair of fashion design at Parsons, and many believe that his unique brand of mentorship, seen on camera, is one of the keys to the show's success. The reason why this is pertinent is because anyone who has watched the program has seen how abysmally the Project Runway contestants perform whenever they are tasked with constructing garments for any body types larger than those of anorexic size-2 models. How disheartening it is to realize that a plus-size runway show at Parsons is no more likely today, over 20 years since Ms. 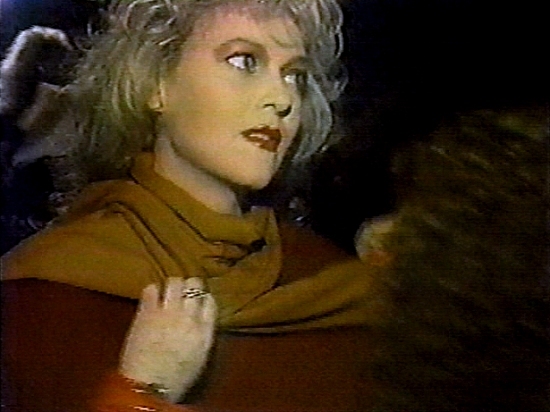 Swift staged her event, than it was in 1989. This is an appalling indication of the limited progress that plus-size fashion has made over the past two decades. But bravo to Ms. Swift for staging this show, which appears to have been the Full-Figured Fashion Week of its day. The world is not shaped by impersonal forces of history, but by lone individuals with a creative vision and the force of will to make that vision a concrete reality. With her princess-like golden curls and her voluptuous curves, Amy was the first plus-size model of whom we ever took note. My eyes! I can feel the fabric scratching them. Horrible, horrible, awful clothing. What were they thinking? Turbans? Really? Why? Turbans are the least guilty thing in this video. I think turbans have the potential to be really beautiful. Imagine a turban made with a beautiful scarf made of some luxurious fabric, like silk, with a flower or feather at the top. It can be a elegant way to hide your hair when you don't feel like brushing it. And I think it could complement a full face nicely. This is a very interesting video, and all the models are really beautiful. Alas, the shapeless form of the '80s was not kind to the plus-size figure, or really to any figure.